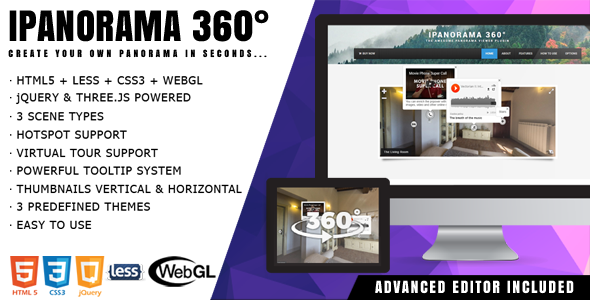 Panorama 360Â° Virtual Tour is a lightweight and rich-feature panorama viewer for the web. This plugin is built with modern libraries jQuery and Three.js to be used for part of backend solutions. Additionally, it has an awesome feature called virtual tour which allowed the user to navigate from one scene to another. Also, it supports hotspots for providing informsation about any part of the scene or for creating interactive tours. It uses their own tooltip system, you can enrich it with text, images, video and other online media. Use this plugin to create interactive tours, maps and presentations.